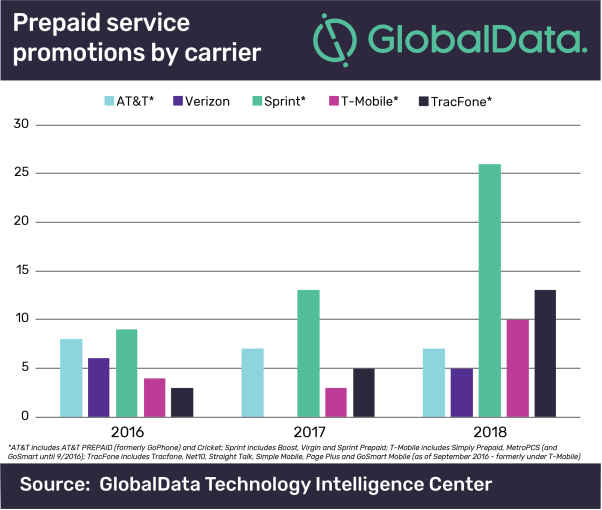 Prepaid wireless carriers launched more promotional service offers* during 2018 than they did in each of the previous two years, confirming GlobalData’s earlier predictions. In terms of prepaid sales promotions** that did not include a device-specific component, the top five national wireless brands were considerably more active during 2018 than in 2016 or 2017, but the carrier with the most promotional activity in 2018 actually started losing prepaid customers. Jamie Huff, Lead Analyst for Global Telecom Consumer Services at GlobalData, says: “Sprint was unsurprisingly by far the most active carrier when it came to non-device-specific service promotions in 2018, offering double compared to the next most-active brand, TracFone. Sprint, including its secondary brands Boost Mobile and Virgin Mobile, has enacted the most prepaid service promotions of all the national carriers since 2013. Tammy Parker, Senior Analyst for Global Telecom Consumer Services at GlobalData, comments: “T-Mobile, including its Metro by T-Mobile brand, enacted more promotional service offers in 2018 than it has in three-plus years. With its renewed focus on prepaid, T-Mobile dominated the action during Q4 2018 and the crucial end-of-year holiday season, when it gained 135,000 net prepaid customers, topping all of the competition for the quarter. For 2018, T-Mobile reported 460,000 prepaid net additions. GlobalData’s research shows Cricket’s gains accrued despite the brand not offering any service promotions in Q4. Furthermore, Cricket achieved a milestone during Q4 2018 when it reached 10 million subscribers, more than double the number served by the brand before it became part of AT&T in March 2014. Parker adds: “TracFone was the second most active brand when it came to prepaid service promotions in 2018. The prepaid brand had 106,000 net disconnections during Q4, which were largely attributable to its SafeLink Lifeline brand. Excluding SafeLink, TracFone gained 66,000 net additions during Q4 2018.